Did you know that 28 percent of smokers report moderate or severe tooth discolouration, compared to just 15 percent of non-smokers? A 2005 study uncovered these statistics, along with additional information about the lifestyle, perception, and dental issues of smokers. The cross-sectional study took place in the United Kingdom, from a random sampling of 6,000 adults. Of those adults, 3,384 were interviewed. In addition, the research team recorded information about the individuals’ smoking habits and collected responses about how satisfied the smokers were with the colour of their teeth. To gauge the accuracy of each smoker’s perception of their own teeth, the study team prepared a set of photos, showing different levels of discolouration and staining due to smoking. Then, each smoker participating in the study was asked to point to the photo that most closely matched their own teeth, specifically with regard to the level of discolouration. A smoker’s teeth often develop spots and stains, which can be yellow, light brown, dark brown, or black. The intensity and number of the stains usually depends on the smoker’s habits. The more a person smokes, the darker the stains become; and smokers who have continued the habit for many years are more likely to have deep staining than those who just started. The study discovered that about 30 percent of the smokers in the study were unhappy with their tooth colour. In contrast, only 15 percent of the non-smokers were unhappy with their tooth colour. It is noteworthy that some tooth discolouration may occur in childhood if a young person is exposed to too much fluoride. This kind of discolouration is known as dental fluorosis. However, dentists can generally tell the difference between the two types of discolouration. Also, the risk of fluorosis is very low for individuals in the United Kingdom, so the possibility did not impact the results of the study. In addition to the pervasive staining that tobacco and tobacco smoke can cause, smoking often leads to other serious medical conditions. Smokers can develop periodontal disease, tooth loss, oral cancer, lesions in their oral mucosa, throat cancer, or lung cancer. According to the researchers, one of their goals for the study was to inspire smokers to quit for their own benefit— not only because of the cancer risk but also because of the aesthetic toll that smoking takes on a person’s smile. 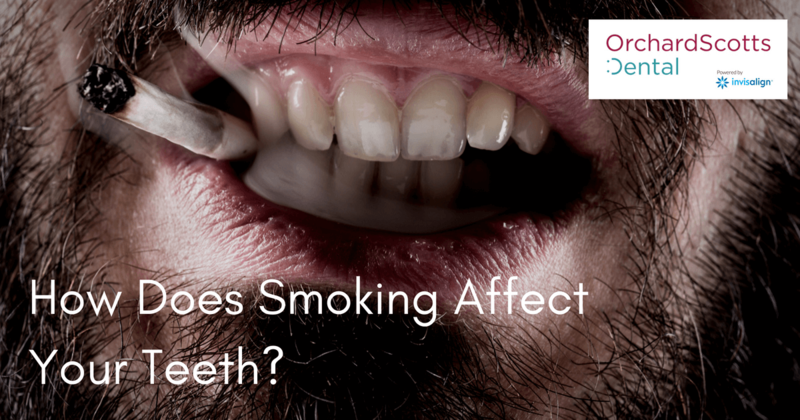 If you or someone you know is beginning to suffer the ill effects of smoking, contact Orchard Scotts Dental right away. The first step towards better oral health is to quit smoking, with the help of family, friends, your doctor, and an addiction support group. Then, your Singapore dentist can begin to evaluate your current situation, including the level of staining, tooth decay or oral disease that the smoking has inflicted. Dental veneers, frequent cleanings, teeth whitening and other methods can be effective in completing the smile makeover and restoring your mouth and teeth to good health. Original Source: “Smoking and Tooth Discoloration: Findings from a National Cross-Sectional Study,” Mhd N Alkhatib,2 Ruth D Holt, and Raman Bedi, BioMed Central, March 2005.